A few weeks back I decided to learn about the superfx chip and this is the result. It's still quite buggy, but I figured it's far enough along to show a video (ignore the bad gameplay). The various caches haven't been fully implemented which causes moderate slowdown. There are also several graphical glitches that need to be worked out as well as getting the other gsu games working. The fpga is quite full and hopefully it all fits. It's not ready for people to test, yet. Once it gets to that point I will post a set of files. Thanks to those who have offered to help. 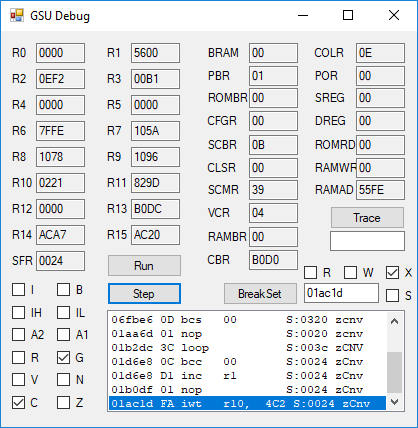 The development platform uses usb2snes to read out gsu state, step instructions, set breakpoints, collect an instruction trace, and other useful stuff. It's been extremely useful in finding many bugs. Source is here, but I haven't checked in the firmware changes necessary to run the fpga file correctly. One area that would help a lot is some self-checking assembly tests. krom has a suite here that all pass, but it would be great to have more tests. After the caches are implemented I plan on writing some myself. Huge thanks to all the bsnes and bsnes-plus developers, the nocash fullsnes docs, krom and his gsu tests which found several bugs early on in development, and ikari for making the sd2snes. Thanks for sharing your (early) work. I would agree with ikari's past advice of getting the implementation mostly working in an emu first. I would *hope* the FPGA can handle the work, but there is that possibility it can't. You know that some ppl in here wanna marry you for showing up with this, do you? If you can get this up and working with SD2SNES hopefully you'll work on the SA-1 chip next. Again even I a non programmer am amazed you were able to get the FX chip cloned/emulated/simulated/what have you so quickly. I am very impressed. I thought Star Fox was crashing on startup, but there it is, running beautifully! Hopefully a proper implementation of the instruction cache and ROM and RAM buffering won't consume too much of the space on the FPGA. Also clearly my firmware hack to try to get the FPGA core loaded was done incorrectly, so I guess I'll just wait for you to commit it. I'm quite impressed by the results and can't wait to run it on my own SNES, buggy as it may be. Also if there isn't enough room on the FPGA, I wonder if it's possible to use the ARM core for some parts of it in a software-emulation style in combination with the FPGA core. Fingers crossed that the FPGA can hold all the caches and such. If not, maybe a new rev is in order? I hope SA-1 is next.